SHANKLIN SCHOTTISCHE BY JOE MORLEY. HOE DOWN BY JOE MORLEY. ALL JOE'S SOLOS ARE TERRIFIC AND THIS IS ONE OF THE BEST. 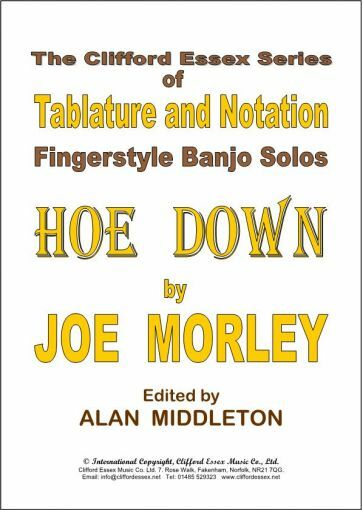 Location: /Sheet music/Fingerstyle Banjo/HOE DOWN BY JOE MORLEY. ALL JOE'S SOLOS ARE TERRIFIC AND THIS IS ONE OF THE BEST. This is not the same as the ‘Hoe Down’ in Morley’s Tutor, but much better. It starts in G major for the first two sections, and moves to C major for the third. 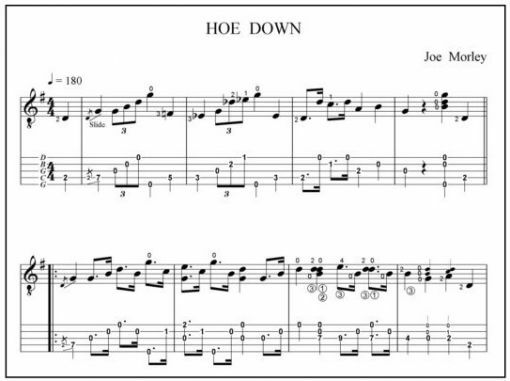 As in several other solos, Morley uses the third string for some of the melody notes, and there are Rasps, Snaps and Slides, which all help to give the piece a typical Hoe Down sound. One of the best Morley tunes, and what’s more, — it’s easy ! The one and only BMG magazine. CLASSICAL BANJO STRINGS. ULTRA LIGHT GAUGE. TIE-ON. 20 - 28. BANJO BOOGIE BY ALAN MIDDLETON. 'A FIRM FAVOURITE'.